Never worry about your phone running out of power when you transfer photos. 2.Charging, card reading can be operated at the same time. 3.No Need APP,Just Plug and Play. 4.Support all ios device runs on ios 9.2 or above. 1. iProducts appear"it does not support this accessory"
Please make sure it was connect well, if the case of iPhone/iPad is too thick, take it off and try again. 4. iPhone/iPad/ipod comes out a sentence"it can not support this accessory"when connect USB keyboard? 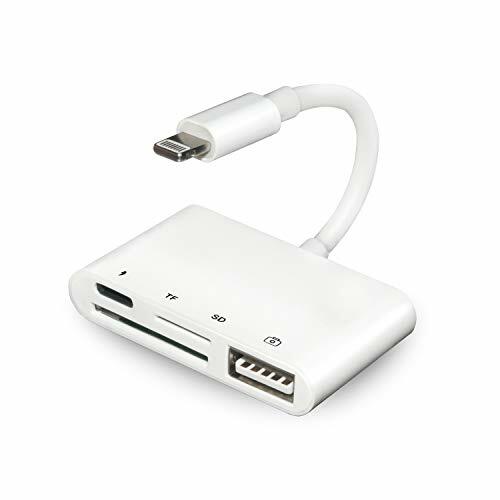 5. iPhone,iPad comes out a sentence"it can not support this accessory"when connect USB-RJ45 Cable? 6. For the SD/Micro SD/ USB,please use only one of them one time. 【4 in 1 Design】The 4 in 1 adapter is the upgrade design from the 3 in 1 SD card reader adapter, it was added a lightning charging port,Never worry about your phone running out of power when you transfer photos. 【USB 2.0 Transfer Speed】14MB/S~16MB/S, USB 2.0 speed. It can easily transfer pictures and videos to your iphone or ipad,share your happiness to your families and friends at anytime anywhere. 【Compatibility】Compatible with ios 9.2 or above, support iPhone 5/5c/5s/6/6 Plus/6s/6s Plus/SE/7/7 Plus/8/8 Plus/X, iPad Mini 1/2/3/4, iPad Air/Air2, iPad Pro etc. 【Plug and Play,No Need APP】No App required, plug and play. Automatically opens the Photos app when connected with camera or memory card, support JPEG/RAW image format and H.264/ MPEG-4 video format. ( for memory card photos and video need to be in DCIM folder).with USB 2.0 OTG interface, your iPhone or iPad could connect USB peripherals like usb flash disk, hubs, keyboard, audio/MIDI interfaces, card readers of SD and Micro SD and more. 【What You Get】1*4 in 1 SD card reader adapter,Risk Free Purchase,100% Money Back Guarantee within 45 days.NOTE:1.This adapter does not support USB devices over 100mA current. 2. SD/TF card reader and USB interface cannot be used at the same time. If you have any questions about this product by UWECAN, contact us by completing and submitting the form below. If you are looking for a specif part number, please include it with your message.